Made with freshly picked Ligurian Basil, crushed pine kernels, fine Grana Padano cheese and Filippo Berio Extra Virgin Olive Oil, our traditional green pesto is sublime stirred into pasta sprinkled with parmesan. 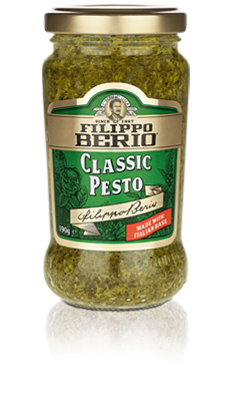 Filippo Berio Classic Pesto is delicious in a host of recipes, on meat or fish, used as a filling in peppers or in chicken breasts, on new potatoes, in place of butter, or mix or drizzle it for an instant taste of Italy. Stir into spaghetti or other pasta and serve with a fresh green salad.